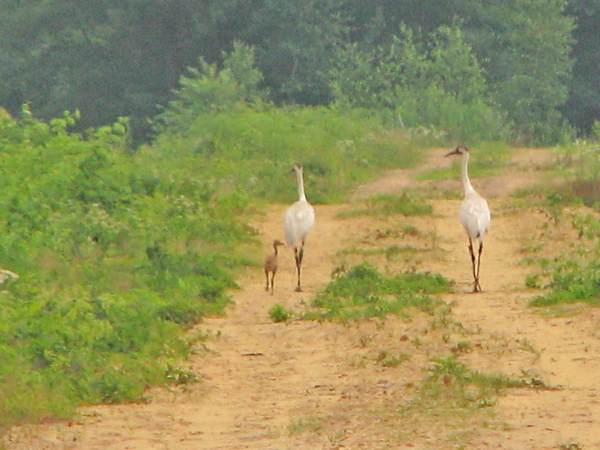 On July 21, 2009, 11 Whooping Crane chicks were transferred from ICF to the nearb Necedah National Wildlife Refuge (NWR) to make up the 2009 Direct Autumn Release (DAR) cohort. The DAR birds are initially isolation-reared at ICF and then at the Necedah NWR until the fall release. 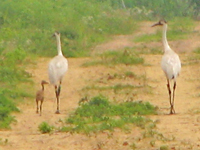 In September or October they are released on or near the refuge with older Whooping Cranes and Sandhill Cranes. They will join up with them and learn the migration route. DAR 33-09 was killed by a predator before migration. DAR 39-09 was moved to a zoo before migration. Group 3 chicks are wild-born. Their parents raise them and teach them to migrate. This is the natural way cranes learn to migrate. One day, the flock will be large enough for wild-born parents to take over. Then human-assisted migration will no longer be needed. Scientists hope to reach their goal of 25 breeding pairs from 125 birds in Wisconsin by 2020. (Both wild-born chicks had disappeared by July 15.